The fight over police budgets in Toronto is intensifying, with the police union threatening legal action over the city's plan to flat-line spending for 2013. Expect similar battles to spread across Canada's major cities in the upcoming year, says criminology expert Michael Kempa. The fight over police budgets in Toronto is intensifying, with the police union threatening legal action over the city’s plan to flat-line spending for 2013. Expect similar battles to spread across Canada’s major cities in the upcoming year. Municipalities in the U.S., England and Australia have been slashing police budgets for several years now — steps to counter public deficits that have so far been delayed in Canada. 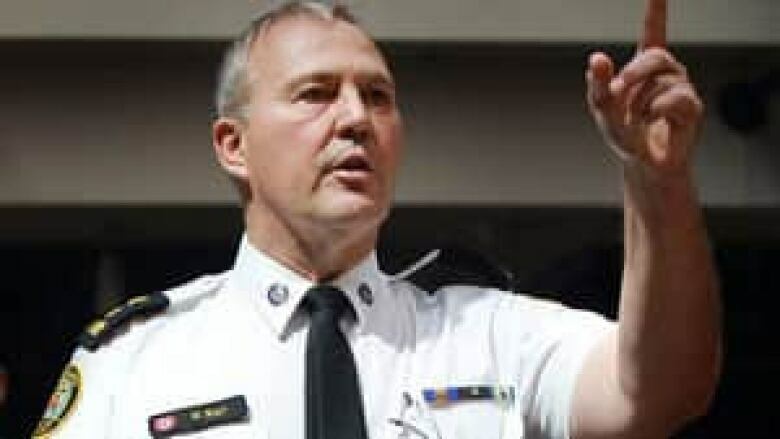 Toronto city council wants to freeze next year's police budget at the current level, while Police Chief Bill Blair says the force needs a minimum 2.3 per cent increase just to maintain the status quo. If he doesn't get it, he says he will have to start laying off frontline officers. The chief will put his case to the police services board for what will likely be the final time on Dec. 10, prior to council locking in its budgets for 2013. While Chief Blair and the union make a passionate case for needing more officers, the fact is that police spending across Canada has doubled over the past 15 years. Police budgets have swelled for a couple of important reasons. One is the constant leap-frogging of police contracts as the big police unions vie to outdo each other. Another is that police have taken on more social order problems – such as dealing with greater numbers of persons with mental health issues without adequate medical care, as well as patrolling increasingly turbulent schools – than ever before in their modern history. With public coffers running dry everywhere, the great fear now is that unless police labour is systematically focused on what it does best, disorganized crisis cuts could damage both police forces and public safety. Canadians have seen and heard all this before, of course. But this time it may be different. Taking on more and more functions has resulted in an astronomical growth in police budgets, dwarfing inflation in recent decades and pitting police chiefs against mayors and police services boards in an annual battle that no one really wins. The city of Toronto's attempt this past week to flat-line next year's police budget — now approaching $1 billion, or almost 10 per cent of the total municipal outlay — is only the most recent to pit budgetary realities against the dire warnings of police. But as Don Drummond, the former banker and associate deputy minister of finance, pointed out in his review of Ontario public services earlier this year, increased public spending on services like police (and health care and education) has coincided with an aging population, the reorganization of the economy and consequent erosion of the tax base that pays for provincial and municipal programs. In this structural situation, something has simply got to give, and the tragedy of putting too much emphasis on policing, at the expense of other public services, is that we have scant evidence that this investment in public safety has made us any safer – or any wiser about how we allocate our policing dollars. Take, for example, the case of putting armed officers in public schools. In recent decades, safety in schools has gradually become a police problem – a long-term trend that was accelerated by panic over high-profile incidents of violence in the 2005 "summer of the gun" and the accidental shooting of 15-year-old Jordan Manners in a North York high school in 2007. Formerly, school safety was almost entirely undertaken by a network of safety officers, as well as community and other helping professionals, who brought the police in on an as-needed basis. Working together, they would mediate disputes before they escalated, provide counseling and job training, maximize legitimate opportunities and harden targets to prevent crime. A community-driven approach along these lines reflects the strategy suggested by the 2008 inquiry into youth violence produced by Roy McMurtry, the former chief justice of the Ontario Superior Court. It is also the preferred option of both the current chair, Alok Mukhergee, and vice-chair, Michael Thompson, of the Toronto police services board. But it nonetheless has taken a backseat to the police-driven model, which has become one of the focus points in the current budget spat. As things stand, 20 fully trained, armed, uniformed police professionals with salaries approaching $90,000 have been deployed in targeted schools to promote crime reduction by dissuading "at risk" youth from slipping into crime, spot-checking for firearms and drugs and providing a deterrent presence. Under the Toronto police service's assumed operational independence, and with the support of the currently shuttered provincial government, this strategy will soon be expanded to 30 officers – though it is unclear that this move has the full support of the police services board or a significant number of downtown districts of the Toronto school board. The police-dominated approach costs a lot more money than community-led approaches, in which a similar cadre of trained helping professionals could be employed for a fraction of the cost. More to the point, do we even know whether doubling down on school safety will lead fewer youths to slip into drug use, violence or gang membership? The independent academic studies that exist and the evidence-based McMurty review tend not to support the police-driven model. How much police attention should be directed at public schools is just one issue in this debate. Do municipalities, for example, need expensively trained police to stand guard at public-works construction sites? Is it time to seriously consider implementing the administratively sensible idea to consolidate human resources across all of the public services, including the police? Similarly, at the "top end" of policing, it needs to be asked whether the police have the right skills for specialized tasks. Should the public police take the lead in cybercrime? Are the public police best placed to investigate complex white-collar crimes, including sophisticated fraud schemes? Do they have the right forensic expertise to run the scientific end of investigation in-house? To help answer the question of at what point in any investigation it might be beneficial and more efficient to bring in outside expertise, the police would be well-advised to bring evidence demonstrating that their skill set on that issue is second to none. At some point, if municipalities really do want to break the cycle of fear-mongering and escalation that has surrounded police budgets, an evidence-based review of police core functions is unavoidable.